We’re building organized competition into Rocket League, and we need your help to test it! Ahead of its official release on all platforms in our Spring Update, the 'Tournaments Beta' version of Rocket League will be available for download on Steam starting Wednesday, February 21, with the beta ending on Friday, February 23. The beta is purpose-built to help us test functionality and the new UI we have created for the Tournaments system. Check out the trailer for the Tournaments Beta up top! How do you get into the beta? Easy! 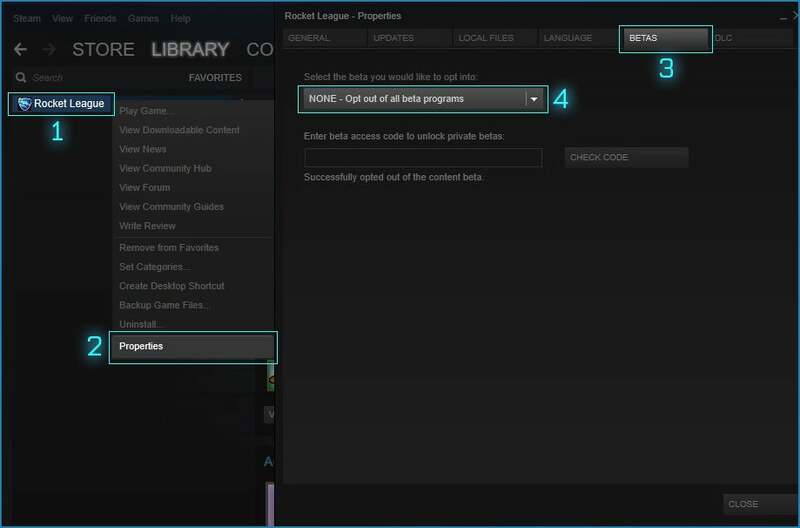 If you own a copy of Rocket League on Steam, all you’ll need to do, starting February 21, is 1) go to your Steam Library on your computer and right-click Rocket League, 2) choose ‘Properties,’ 3) click the ‘BETAS’ tab in the pop-up window, and 4) choose ‘Tournaments Beta’ from the drop-down list. After closing the pop-up window, your Steam client will update Rocket League to the beta. Once you have the Tournaments Beta downloaded, you will be able to create your own tournaments and join competitions created by other players. The ‘Tournaments Beta’ version of Rocket League replaces the ‘Live’ version you already have installed, but it will NOT erase your XP, inventory, replays, or other player data. Your control configuration and some audio and video settings may change. Competitive Playlists will not be available in the Tournaments Beta. Other functionality may also be limited. Once the Tournaments Beta is over, or at anytime during the beta if you want to hop into a Competitive Playlist, simply go back to the ‘BETAS’ tab in the menu we mentioned above, choose ‘NONE - Opt out of all beta programs,’ from the same drop-down list, and Steam will download the latest ‘Live’ version of Rocket League. There is no cross-platform functionality in the Tournaments Beta. We’ll be taking in all of your feedback about the beta on our Subreddit, as well as our Facebook and Twitter pages. Oh, and that new logo you spied in the trailer up above? We’re going to be celebrating the 10th anniversary of Supersonic Acrobatic Rocket-Powered Battle-Cars all year long, so look for the logo in all of our trailers throughout 2018!